Whether it's business documents or homework, the HP 948c pulls through with excellent quality printouts. Sooner or later your HP 948c will gobble up all of your printer ink, and when it does you'll soon notice that buying HP 948c ink is typically pricey. However, you have no need to fret about coughing up the steep costs you'll find on the high street because here at Cartridge Save you can buy all the HP 948 c cartridges you'll ever need at seriously small prices. Save more money on your ink by purchasing with Cartridge Save! There's no sense at all in spending so much on the 948-c original cartridge or 948c compatible ink down the main street when it is far more simple to save a bundle of money ordering online with Cartridge Save. You enjoy total confidence when ordering DeskJet 948c ink cartridges from us because every single one is underwritten by a no quibbles money back guarantee. Be mindful of the fact that each purchase has free delivery, generally arriving at your door on the following working day! The HP Deskjet 948c printer claims speed, versatility, and excellent output, which makes it a good choice for an affordable device for school and at home. As a personal printer, the HP 948c is compact and fits most spaces at home or in a dorm room, and it supports a good selection of media to allow users to be more creative. HP markets the Deskjet 948c as a small office device, too, but its speed, media capacity, and overall performance may not be enough to support a small workgroup. A breadbox-type exterior with rounded edges makes the HP Deskjet 948c colour printer look sleek. This design is a departure from the previous clunky plastic printers by the same company. This desktop personal inkjet printer weighs 5.71kg and it is surprisingly compact, measuring 7.7 inches tall, 9.8 inches deep, and 17.3 inches wide. The HP Deskjet 948C inkjet printer connects to a PC via a parallel or USB cable, and runs on 2MB RAM. The Deskjet 948c printer is sturdy and fairly quick to print with speeds of up to 10ppm in colour and 12 ppm in monochrome. Furthermore, the HP 948c inkjet printer is user-friendly because of the plug-and-play interface, and it installs quick so users can print high-resolution 2400x1200dpi graphics in no time. On the whole, the HP Deskjet 948c printer is very easy to use and offers lots of versatility when it comes to paper handling options, too. 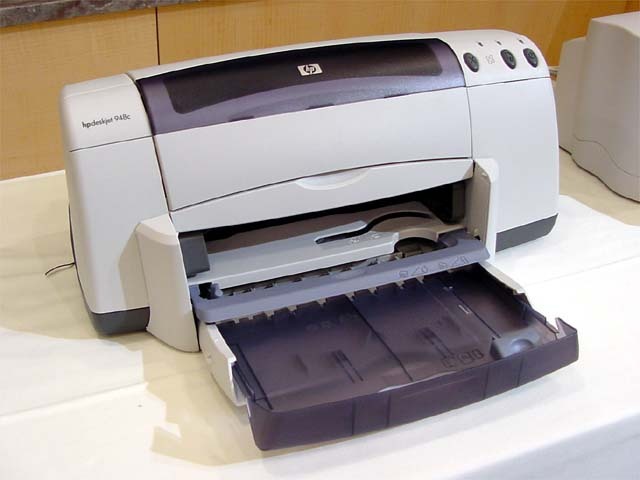 Computers running on Windows 7 have issues with the HP Deskjet 948c colour inkjet because the plug-and-play interface is not compatible with it. Likewise, users that have a Mac Snow Leopard operating system cannot find support for this printer. Users might be disappointed with the lack of support for the Deskjet 948c printer once the warranty expires.